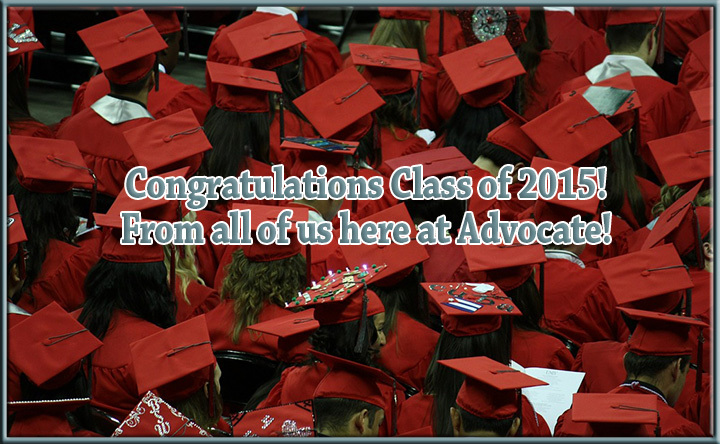 Congratulations Class of 2015, from all of us here at Advocate! - Scarsdale Premier Insurance Agency | Advocate Brokerage Corp.
Congratulations Class of 2015, from all of us here at Advocate! High value watches or other jewelry can be a gift that will stay with your child for the rest of their lives and serve as a symbol of this important day. Plus, a watch is a gift they will always be able to use. High value jewelry items may be covered under your homeowner’s policy or insured separately with jewelry insurance. This often depends on the value of the jewelry item, as many Homeowner’s policies have limits on how much will be paid out towards jewelry. The insurance is a small price to pay for peace of mind, especially as the value of the jewelry increases over time. An insurance policy may also be a good idea if your child is bringing the jewelry with them to college, since they will have an increased chance of the jewelry being lost or stolen. Any graduate would be excited to have a new car to take to their first year of college! Keep in mind that certain vehicles will be more expensive to insure, especially for younger drivers. Check out our blogs on the most and least expensive cars to insure here and here. If your child is going to be living on campus, there are additional considerations to make. First, look into the school’s policy on students having cars on campus as a freshman. Second, check your policy details on permissive use, just in case your son or daughter lends their car to a friend on campus and something happens. Be sure to review the rules with your child so that they understand what is expected of them. Third, you will want to make sure that you notify us about the new garaging address for the vehicle. Finally, your child may also qualify for a good student discount. Certain carriers offer discounts if students maintain a specific GPA while attending school. If your graduate receives a new Macbook or an iPad as a graduation gift, you may want to look into special student insurance policies. Although most of the time your child’s belongings are covered under your Homeowner’s insurance even if they are living on campus, the deductible is often much higher than it would be for a special student policy. In most cases, these policies cover damages and theft. A home is quite a graduation gift, but some parents feel as though it may be a better investment to purchase a condo for your child to live in during their four years in school rather than wasting money on dorm expenses. If you fall into this category, there are a few things you are going to want to think about first. First, it is important to make sure the college your child is choosing is one that they can see themselves at for four or more years. If they decide to transfer to a different college after a year or two, you will still be responsible for the condo you purchase. Second, if your student decides to study abroad for a semester or two, you will still be paying the mortgage and insurance on the property while they are studying abroad. Third, will also want to consider the possible liabilities involved with your student living off-campus. For example, if they have some friends over and someone under age consumes alcohol, you would be held liable if any type of accident occurs once they leave the condo. We hope that this blog will help you to answer questions you may have regarding certain graduation gifts. As your insurance Advocate, we want to make sure you have the information you need to make a well informed decision. Should you have any further questions on the subject, we encourage you to give us a call. One of our customer service representatives would be happy to answer your questions.